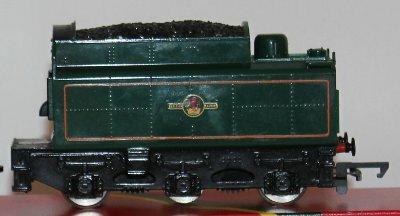 Hornby Railways R063 OO gauge class 7P6F steam loco and tender. This is B.R. Britannia 4-6-2 engine in Brunswick green with orange and black lining and the lettering in yellow. This model was produced by Hornby from 1960 until 1979, and we believe this example was made in 1976/1977. Condition: This Hornby loco is in working order. The box is present but is worn.